Rare footage of a thunderstorm filmed from onboard the International Space Station (ISS) has raised more questions than answers for scientists, according to a new study. Described as a first of its kind, footage of “elusive blue jets” was filmed in 2015 over the Bay of Bengal by European Space Agency astronauts using the most sensitive camera on the space station. 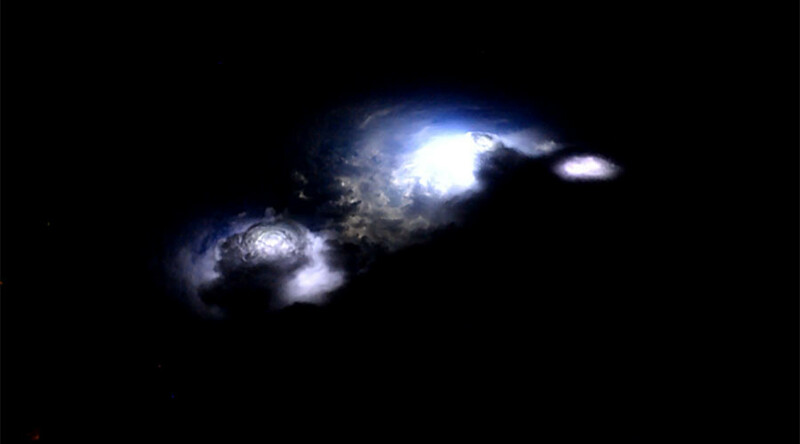 Gigantic electrical discharges and jets can be seen in the footage with numerous flashes visible within the storm clouds. A number of blue-purple discharges are followed by a “pulsating blue jet” shooting up out of the cloud. These “astonishing” jets reach up to 40km (25 miles) in height before fading, according to the study, which was published by Denmark’s National Space Institute as part of an experiment known as THOR. Blue jets can move at speeds of up to 360,000kph (220,000mph) and without a high speed camera they can be easily missed by the human eye. Similar studies will be taking place later this year with the Atmosphere–Space Interactions Monitor launching with the aim of monitoring such “transient luminous events” on an ongoing basis.